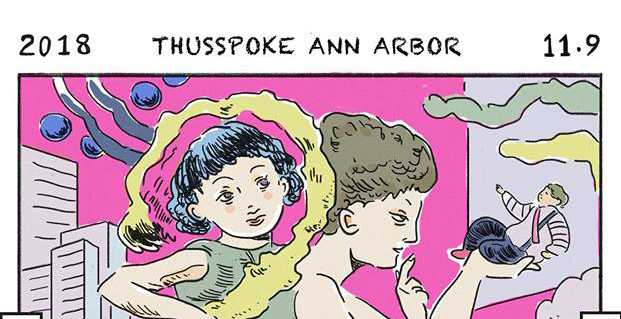 I had been made extremely curious about this semester’s performance by “安娜说 / Thus spoke Ann Arbor” from viewing the gorgeously illustrated posters brightening up campus in the weeks leading up to the show. While I had been aware of the group for several years now, I finally decided to attend their performance for the first time, and after seeing it I can confidently say that I couldn’t have made a better decision. After arriving early to make sure to get seats near the front of Lydia Mendelssohn Theater, we were informed that it would be a full house, which hardly came as a surprise at that point due to the fact there was only a few empty seats in sight and the noise level had grown to a nonstop roar. One of the elements I appreciated the most about the show was the choice to divide the performance up into three shorter plays. It gave many more of the club’s members time to shine in a leading role than if they had just done one play, and the group was also able to challenge themselves to perform three distinctly different styles of play, suiting different members individual strengths. The first play was a comedic romp titled “黑暗中的喜剧 / Comedy in the Dark.” The play used physical and situational comedy as characters unveiled hidden secrets in a darkened apartment after a freak power outage. The second play, “人质 / Hostage“ was the shortest of the three, and featured a very limited cast and set. Instead it was more figurative dark comedy to the first play’s quite literal one, with two thieves mistakenly taking a suicidal girl hostage in an attempt to escape the police hot on their trail, and the intense interplay that followed. The third and last play was “立秋 / The Start of Autumn” set around a century ago in China. This was by far the most serious of the lot, and told the story of several families internal drama as well a competition between tradition and newly adopted Western ideals. The transitions from play to play were quick and painless, with crew members scurrying about to clear the relatively complex set up of the first play for the instead very minimal one of the second. Considering how long the night was already, nearly reaching a full three hours, I appreciate the brevity in these areas. The one drawback to the set up was that by the time the third play began most of the audience, myself included, seemed to be getting restless. With no intermission, the last play with its distinct five chapters and several scenes basically revolving around intense discussions about banking and finance, I’m not proud to say that I was more than a little glazed over myself. But the fact that the group did manage to hold the audience in rapt attention for the nearly two and a half hour run of the show is impressive in and of itself. Additionally, while there were undoubtedly a few intentionally humorous moments in the second two plays, especially the second one, because the audience had been primed to laugh in the over-the-top comedy of the first play, I noticed that the audience, myself included, began to burst into laughter even in otherwise inappropriate moments. While the group could have easily put on the play without adding subtitles on projections on either side of the stage for the very small percentage of the audience with less than fluent Mandarin, I appreciated the extra effort put in to make the performances accessible. As a member of that small percentage myself, I definitely found myself referring to to the subtitles frequently throughout the night, especially if a character was talking quietly and I was struggling to hear what they were saying in the first place. That being said, with so much physical comedy getting the most laughs in the first play, and the more subtle acting in the second two, the experience was definitely better when ignoring the subtitles and instead focusing on all that activity on stage. The actors and actresses couldn’t have done a finer job, and I didn’t catch a single slip up as they all seemed to have prepared their lines to perfection. There was one humorous moment in the first play, however, when one of the sofas being used as props collapsed to the floor. But like true professionals the actors and actresses continued undeterred, even finding time to prop the sofa back up, resulting in another wave of laughter. I was impressed by the professionalism of cast and crew alike, with the obvious hard work preparing for the show paying off. I definitely plan on keeping an eye out for their performances in the future, and attending all that I can. Abby is a Junior dual degree student in the STAMPS school of Art and Design and LSA. When she isn't attending events around campus she likes to go running in the Arb, drawing, and learning languages.